I tell you, I am loving the self-publishing revolution. A year ago, I threw my hat into the self-publishing ring and created a basic epidemiology text that I sold as a Kindle ebook on Amazon. 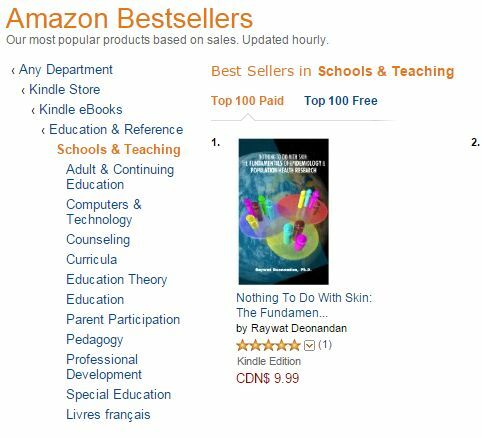 Due to a variety of factors –niche marketing, support of students and colleagues, etc– the title actually became a #1 Amazon bestseller! A year later, I re-issued my out-of-print short story collection, Sweet Like Saltwater, as an ebook. After a one day campaign in which I gave it away for free for 24 hours, the title actually hit #2 on the Amazon download list! Well, a year after Nothing To Do With Skin made the #1 spot, it did it again…. 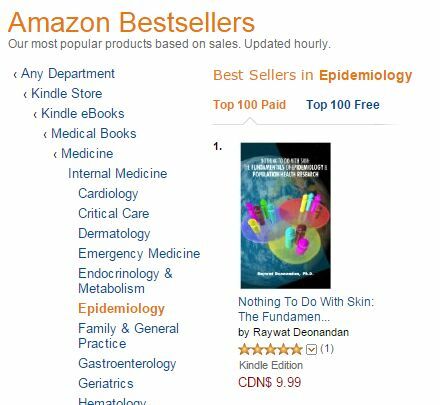 …and not just in the Kindle category, but also #3 among general books, in the epidemiology category. It’s also #3 among all Medical books, #1 among books about research, #1 among books about School & Teaching, and #1 among books about Education Theory (even though it has nothing to do with education theory). This is cool. But there’s another cool element to this story, and that’s the print copy aspect of self-publishing. While ebook publishing has made self-publishing an easy and zero risk endeavour for all putative authors, print-on-demand has made physical book distribution an accessible modality, as well. 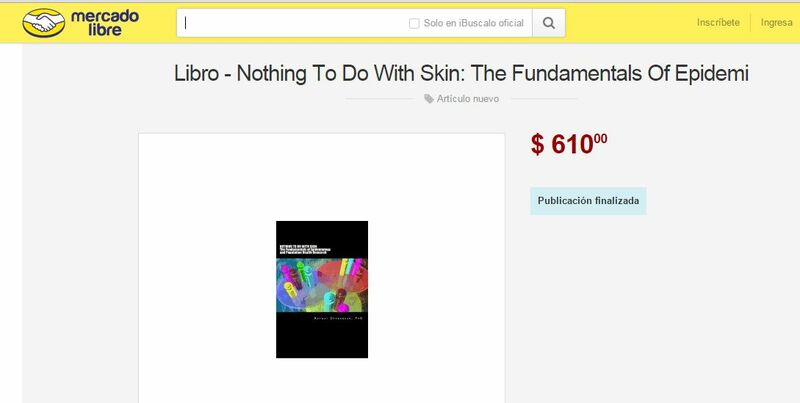 Many months ago, I created a physical version of Nothing To Do With Skin through Amazon’s print-on-demand partner, CreateSpace. What I did not know is that CreateSpace seems to have its own worldwide distribution process. This means that booksellers around the world are free to market my physical book, through the CreateSpace portal. In other words, through effortless self-publishing, I have managed to attain a degree of global, physical distribution. I don’t know if these re-sellers just randomly plow through print-on-demand titles, or actually do some directed pruning. I do know that a couple of these sites took the time to re-write both my book’s description and my bio, to make it optimal for their sites. That shows a deliberate selection process. I like to think that the Amazon bestseller status was the trigger to encourage global re-sellers to add my title. So what’s the lesson here? It’s that self-publication is very much a viable option for certain types of writers. It’s also that success in the electronic format (bestseller status in a niche category) may translate to adoption by global re-sellers for the physical version of the book. This means that creating a print-on-demand version appears to be a good idea, especially since it costs nothing to do so, and each book sells for substantially more than the ebook version.